DIY - How To Make A Mini Rotary Dremel Tool! DIY – How To Make A Mini Rotary Dremel Tool! 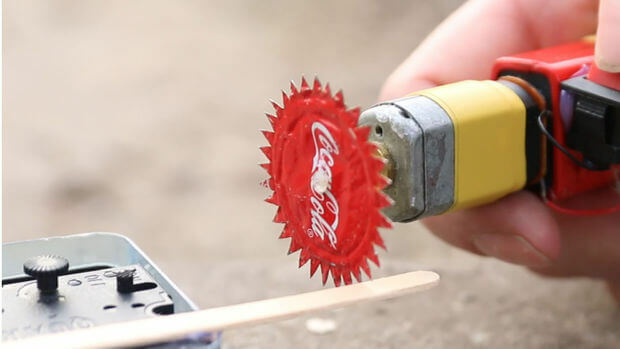 Rotary tools are one of the tools that are most frequently used in both metal and wood working projects, but Rotary tools are little expensive, so in the video below you can see how to make a homemade mini dremel tool from household items like coke cap for saw blade, small dc motor from an old toy, momentary switch and some srews. This simple build uses a small motor, a 9 volt battery, a switch, and some hot glue to form the bulk of the tool. The cutting wheel is made from a repurposed bottle cap and a pen refill. It’s keen enough to cut through softwoods, but I wouldn’t recommend using it on metal unless you like having Coke cap shards in your eyes. Rob Venomous pulling his son’s tooth with his Chevy Camaro! Caterham Brutus 750 – Distinctive, Adaptable, Fun & Easy Motorcycle To Ride! The 2016 Chevy Volt plug in hybrid goes lighter, faster and more fuel efficient! Suzuki Hayabusa Turbo Rider Goes Wild at 248 Mp/h ! !